The West African Ebola Epidemic of 2014-2016 sickened more than 28,000 and took the lives of over 11,000 persons, with 11,000 cases and 4800 deaths in Liberia. Near the beginning of that epidemic, the Liberian Council of Churches proclaimed that the Ebola “plague” was a punishment from God for corruption and immoral acts (homosexualism [sic]) and called for prayer, fasting and repentance.3 Here, we review our efforts and the lessons learned from walking alongside the Liberian United Methodist Church (UMC) to inform national leadership, to conduct educational outreach, and to disseminate printed materials—grounded in an ecumenical ethos—among various national and transboundary faith communities. Our experience offers a pathway for incorporating frontline faith leaders of any religion into prevention and control efforts in any society, thereby aligning the goals of those partners seeking health equity. The United Methodist Church (UMC) in Liberia has around 600 churches, 1,000 clergy and 240,000 congregants in the 15 Liberian counties. Moreover, there are about 16,000 students in UMC primary and secondary schools, 4,000 in United Methodist University, and the UMC operates a national acute care hospital along with primary care clinics in its 22 administrative districts. To reach these end-users, we developed a booklet covering the natural history of EVD, previous outbreaks, symptoms, transmission and prevention.4 It contained a section of frequently-asked questions regarding transmission, prevention, and protection and was aimed at a general audience in a high-context society, utilizing local idioms and analogies. The UMC Liberia Publishing Team printed 6,000 booklets. Along with emergency food and hygiene supplies, the booklets were distributed in each of the 22 administrative districts around the country with larger allotments to those districts with more churches and clinics, and/or higher school enrollment. It was used in personal conversations, pastoral counseling, meetings with church groups/health committees, congregation-wide training and informational sessions, and in community-wide meetings sponsored by local churches, schools and clinics. The booklets were shared with other faith communities including Baptists, Catholics and Muslims. 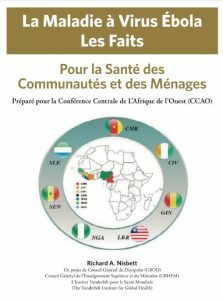 Copies were distributed to Methodist partners in Sierra Leone and 30,000 copies printed in French were distributed to Francophone populations in Guinea, Cote d’Ivoire, Senegal, Nigeria, and Cameroon. The French version was revised, and 5,000 copies tribute in the DRC by UMC partners in 2018. The advent of the West African EVD outbreak was marked by rumors, misinformation and fear-of-the-unknown. The booklet was disseminated when fear thrust faith leaders into health-leadership roles because government messaging was neither helpful nor hopeful. Official government communications were interpreted by locals as “There is no cure; don’t touch anyone or be intimate.” Naturally, the booklets were embraced, offering knowledge for empowerment and informed decision-making, and, most importantly, hope. As the booklets were deployed and re-supplied, those who had seen and used the booklets commented, in the aggregate, that it was “written in clear, simple style,” “easily understood,” was “devoured like it was hotcakes,” “answered our questions,” would have a “lasting role for teaching” and an “enduring impact” on church and society. Madon et al. 5 aptly described the challenges that poverty poses for global-health implementation science as “a bewildering constellation of social constraints and health threats.” Globally, faith communities are seldom absent where poverty flourishes and faith leaders are often well positioned to act as cultural mediators. Faith leaders have high literacy and numeracy and sustaining commitments to service and provision of care. For example, during the EVD timeframe, members of our team conducted a health-oriented roundtable at a Nairobi, Kenya conference of 18 academicians representing the dozen Methodist theology schools in Africa. The unanimous sentiment was that health was not only a salient development issue for their clergy but also a vital part of their ministry and pastoral care duties. They expressed the desire for more information and training and recognized the need to work closely with public health and clinical partners in the provision of care, prevention and control. Frontlines practice requires an expansive, inclusive perspective on medical cosmology, community dynamics, leadership structures, and the role of faith leaders as natural helpers. Best-practices public health offers preferential options for the poor.7 Frontlines practice facilitates social capital formation. When we align with the priorities of faith communities, we not only tap into their trust reserve of social capital as collateral but also we introduce public health perspectives into faith communities which enhances prospects for our shared goal of health equity. RAN, the corresponding author, wrote the booklet and prepared the first and final drafts of the manuscript. EJS edited the booklet and oversaw Liberian printing and distribution and edited the submission. MSG coordinated the fund raising, oversaw USA printing of the booklets, arranged shipment and distribution to partners in other African countries, and edited the submission. All authors read and approved the final manuscript and are guarantors of the paper. We’d like to thank active partners Dr. Sten Vermund, then Director of the Institute for Global Health at Vanderbilt University School of Medicine, and now Dean of the Yale University School of Public Health; Rev. Dr. John Innis, then Bishop of the Liberian Annual Conference (LAC) of the United Methodist Church (UMC) and now retired; Dr. Steve Bryant and Robin Pippin of the UMC Discipleship Ministries; and Dr. Amos Nascimentos of the UMC General Board on Higher Education and Ministry. We are grateful to the donors who made possible the printing and dissemination of "The Ebola Virus Disease Fact Book" including: Canterbury United Methodist Church of Birmingham, Alabama; EBSCO Industries of Birmingham, Alabama; Heartspring Methodist Foundation of Houston, Texas; Independent Presbyterian Church Foundation of Birmingham, Alabama; and The Thompson Family Foundation of Birmingham, Alabama. Dr. Yed Esaie Angoran of the West Africa Central UMC Conference of Côte d'Ivoire, translated the English version into French and was responsible for design, layout, and distribution of the Francophone version. Finally, we wish to express heartfelt admiration to the entire LAC Leadership team, LAC educators, clergy and community members for their courageous and inspiring efforts to defy EVD in Liberia by living their faith and bridging sectoral, denominational, agency, and international boundaries. You emboldened us to walk humbly alongside you and together we left a roadmap for all those who answer the call to serve. This work was supported by private donations. No external funding supported this publication. Donations were raised for supplies, food and printing of the booklet. The authors have no competing interests or conflicts-of-interest. The humanitarian effort was approved by the Bishop and Executive Board of the Liberian Annual Conference of the United Methodist Church. The booklet was distributed along with food and hygiene supplies. There were no human or animal research subjects. Patheos 2014, Catholic Archbishop, https://www.patheos.com/blogs/progressivesecularhumanist/2014/10/catholic-archbishop-ebola-is-punishment-from-god-for-homosexuality/, retrieved June 8, 2018; and Daily Observer 2014, God is Angry with Liberia, https://www.liberianobserver.com/news/god-is-angry-with-liberia/ , retrieved June 8, 2018. Nisbett, RA, “Ebola Disease Facts for Community and Household Health,” Discipleship Resources International 2014 (digital copies in English and French are available from the corresponding author upon request). Madon T, KJ Hofman, L Kupfer, RI Glass (2007). Implementation Science, Science 2007 (318): 1728. 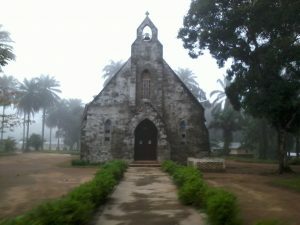 Kalenga OL. We’ve halted the spread of deadly Ebola in Congo – so what went right? The Guardian 2018, https://www.theguardian.com/global-development/2018/jul/25/halted-spread-deadly-ebola-drc-oly-ilunga-kalenga?utm_source=esp&utm_medium=Email&utm_campaign=Global+Dispatch+collection&utm_term=282054&subid=12289974&CMP=poverty_matters_collection, retrieved 25 July 2018. Farmer, P, Pathologies of Power: Health, human rights and the new war on the poor. Berkeley: University of California Press, 2004; and H Saussy (ed. ), Partner to the Poor: A Paul Farmer reader. Berkeley: University of California Press, 2010.